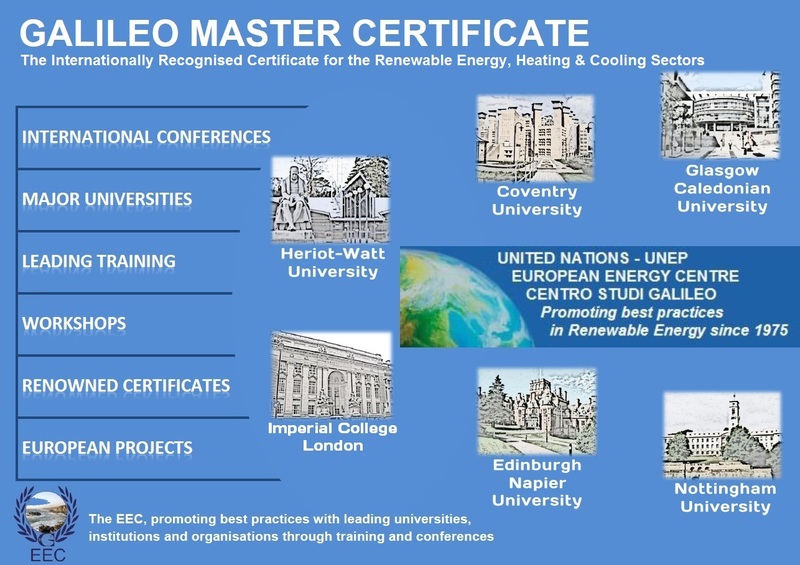 "Promoting knowledge-sharing and best practice in Renewable Energy and Energy Efficiency with leading universities and the United Nations (UNEP) through Professional Training Courses, Conferences , Publications, European Projects, Global Partnerships, Membership Programmes and the Internationally Recognised Galileo Master Certificate. " The professional renewable energy and energy efficiency training courses are organised in collaboration with leading European and International Universities. Participants benefit from the practical and theoretical knowledge of a range of renewable energy and energy efficiency systems, taught by University professors and leading experts in their field with more than 30 years of theoretical and practical experience. The EEC trains around 5000 individuals a year in over 300 training courses at 21 universities across Europe. The internationally recognised Galileo Master Certificate (GMC) is awarded to successful course participants, as important evidence of the theoretical and practical skills required of professionals and quality technicians in the industry. It provides a clear gateway to a career in the renewable energy sector. The teaching, which leads to the GMC, is based on the European Project EMTEU (Energy Management Technician in Europe). Previous participants of our courses include representatives from Mitsubishi, Siemens, British Army, Solar Power Scotland, Nestle, Coca Cola, and NATO amongst others.